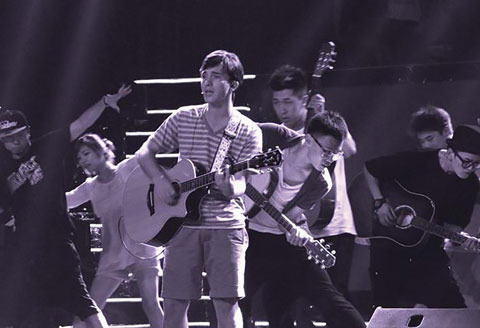 Student musician is a pop star in China. On a July morning in 2012, Clay Garner woke up to find that he’d gone viral in China. Garner, ’17, a singer and musician, took Mandarin during his freshman year of high school back in 2009. In a bid to improve his language skills, he began posting covers and original songs in Mandarin to Chinese video platforms under the name given by his teacher: Gaoshan, or “tall mountain” (funny, he says, “because I’m not tall at all”). A few years later, he hit the internet big time, stunned to see thousands of comments about his cover of a popular song by Chinese artist Wanting Qu. Now a senior majoring in East Asian Studies, he hopes to pursue a career at the cross-section of Chinese and American media. As for music, Garner says he has new material in the works—we haven’t seen the last of Gaoshan yet. How different contraceptives weigh in ecologically. Stanford data visualization software aids Panama Papers probe.